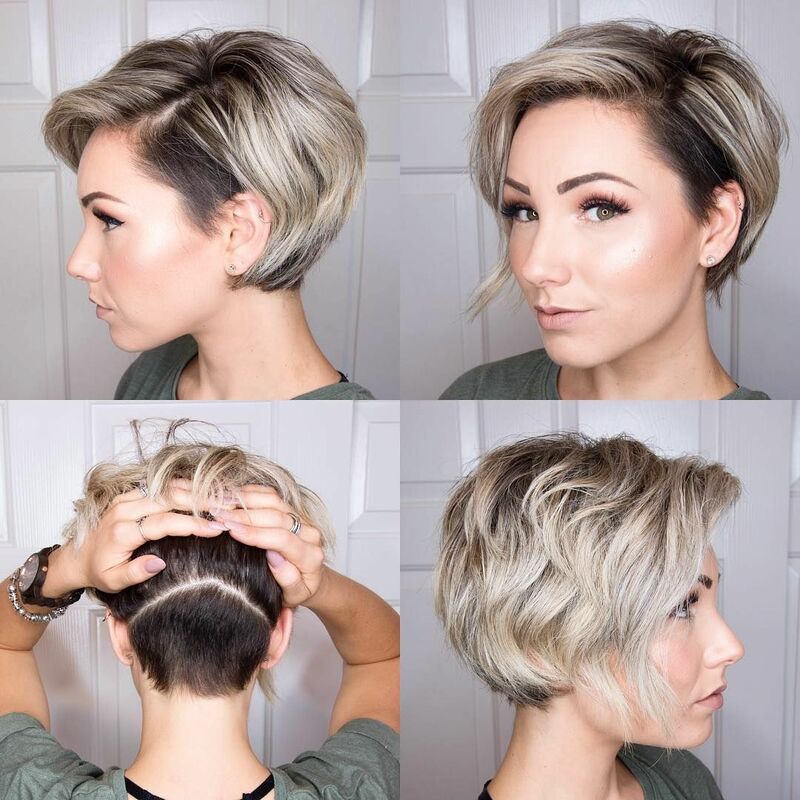 It’s time to get a new cut now, a lot people is going to short these days, if you want to cut your hair shorter this?time but?have no ideas what to sport,?get short hair?inspirations for your next cut with?these cool stylish cuts below. 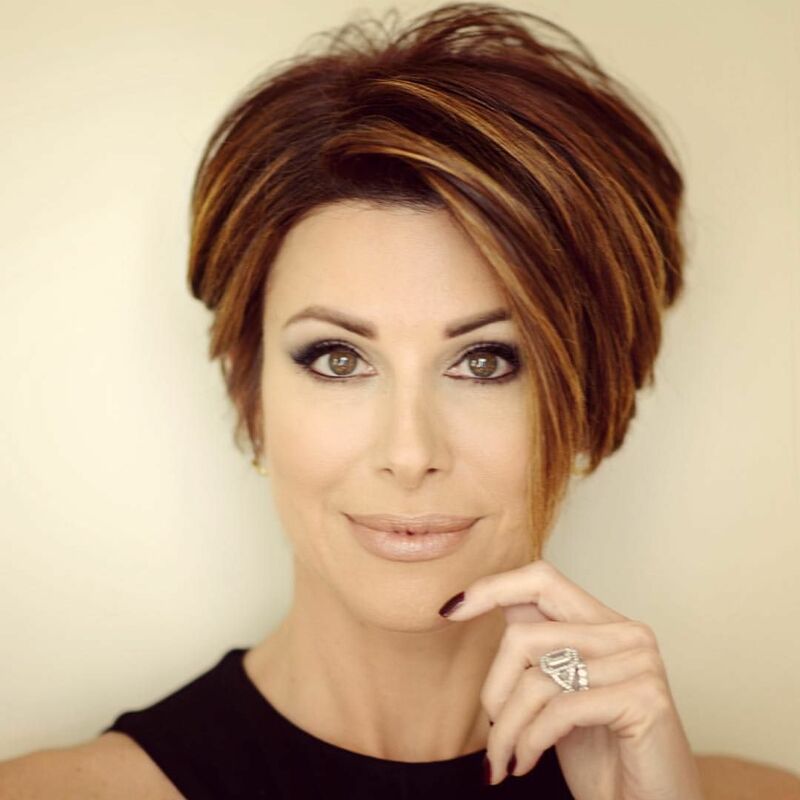 This is a great daily hairstyle for anyone with an oval face and thick hair.? 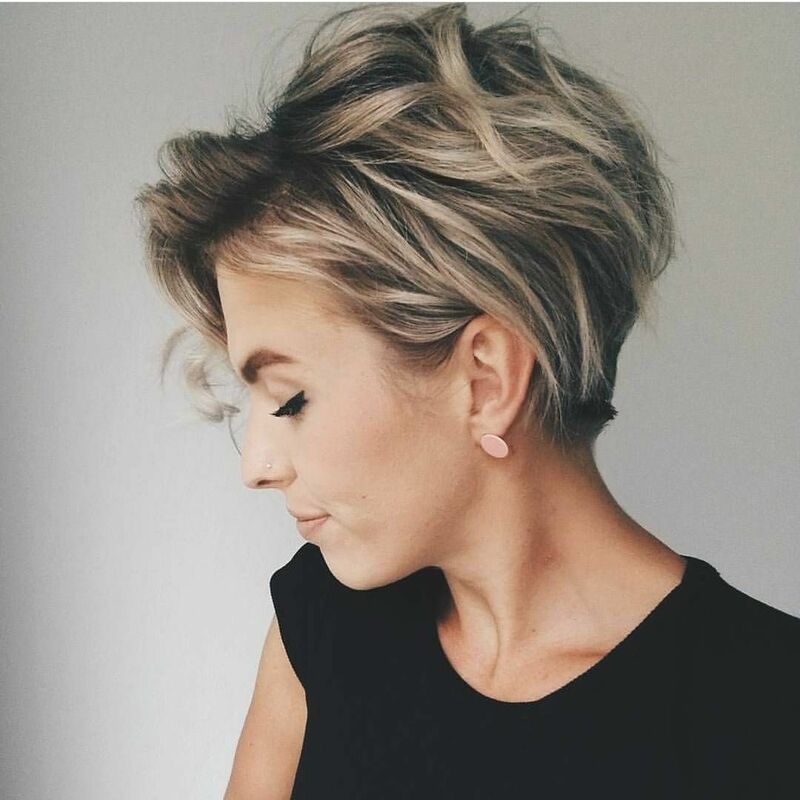 It’s quite long for a pixie haircut and really demonstrates how you can continue with simple hairstyles, when your pixie is growing out.? 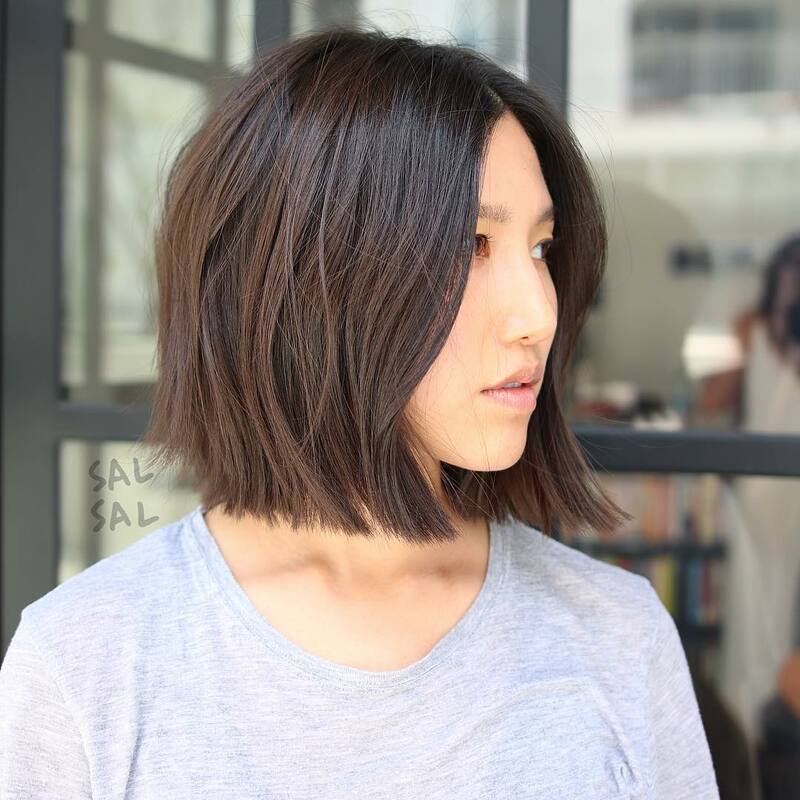 The long layers rely on dense hair to create a lovely rounded shape at the back, graduated to curve in nicely at the nape.? The side parting can be worn as a centre or off-centre parting on an oval face, and drapes over one side in an extra-long fringe.? This is a soft look, with pretty curves and long side-burns that really makes the best of medium – thick, straight hair. 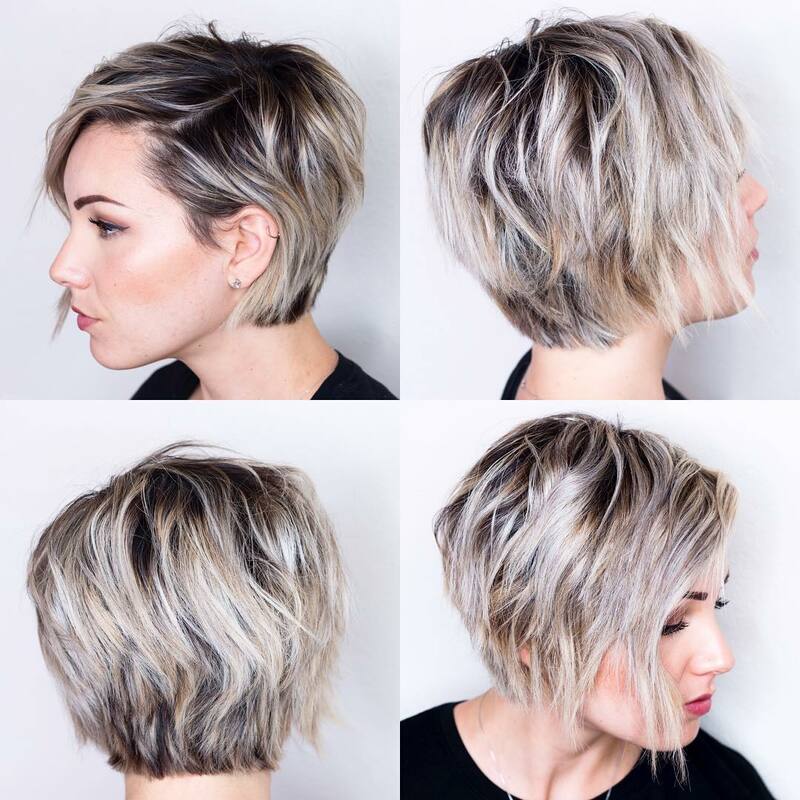 Short edgy haircut for women: Piled on top with heaps of volume and finished off with a bright, look-at-me blue hair color, this bold style surely isn’t for everyone! 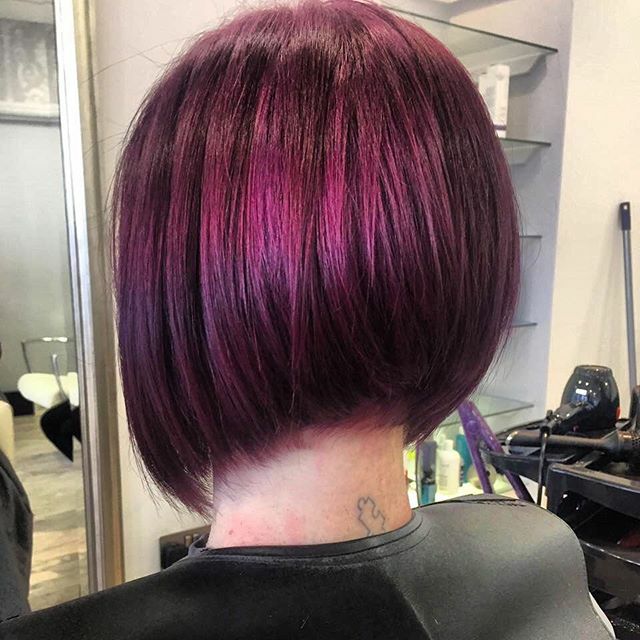 If you’re looking to make a statement wherever you go and love the edgier styles in life, consider this vibrant and powerful style. 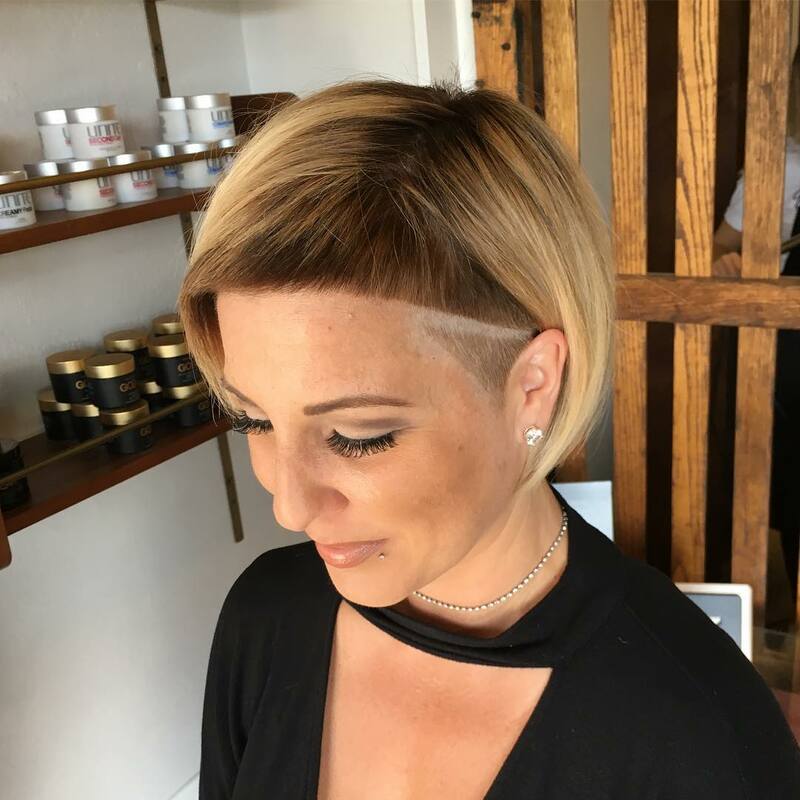 Don’t forget the side part and tousling to add to the edgy effect. 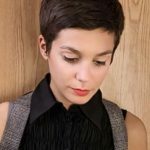 Short haircut for round face shapes: I love the current trend for 50’s and 60’s vintage clothes, which were smarter and more tailored than the ubiquitous T-shirt and leggings!? 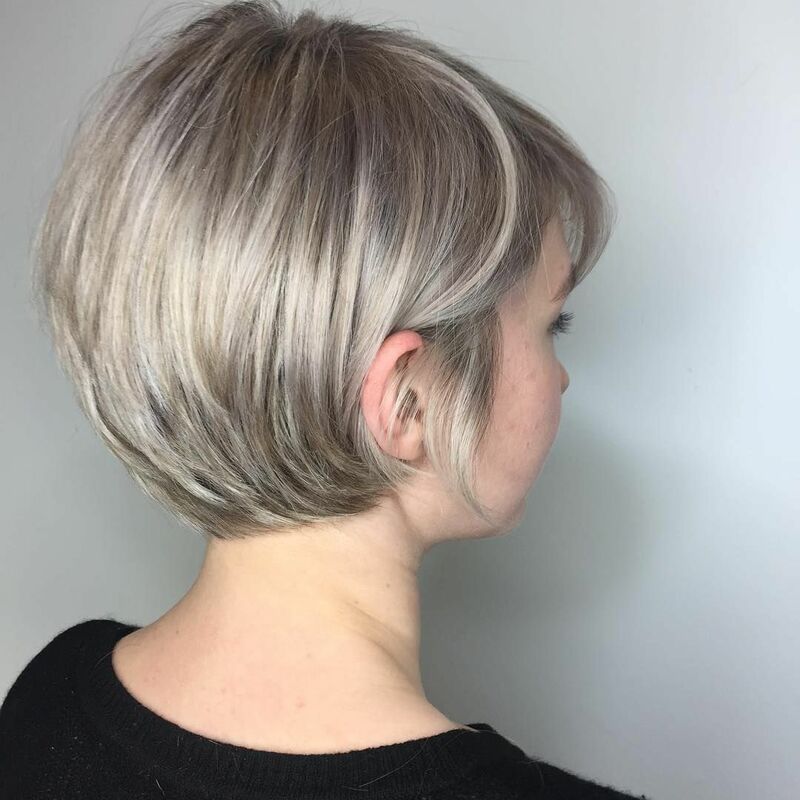 This super-cute pixie cut is just right for wearing with your pretty, new outfits, as it was introduced by U.S. film star Mia Farrow in the 60’s.? 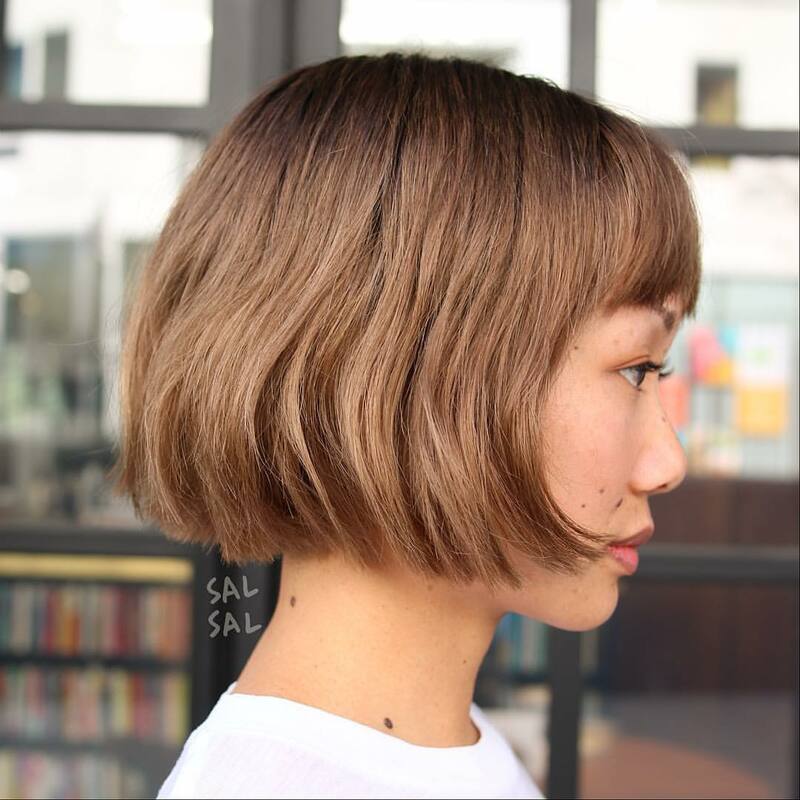 You can adjust the side-parting to flatter a round face perfectly and the sharp side-points diminish the curviness of round cheeks with a lightly tousled, modern finish! If you love a high-fashion look with geometric cutting and strong lines, here’s something for you.? 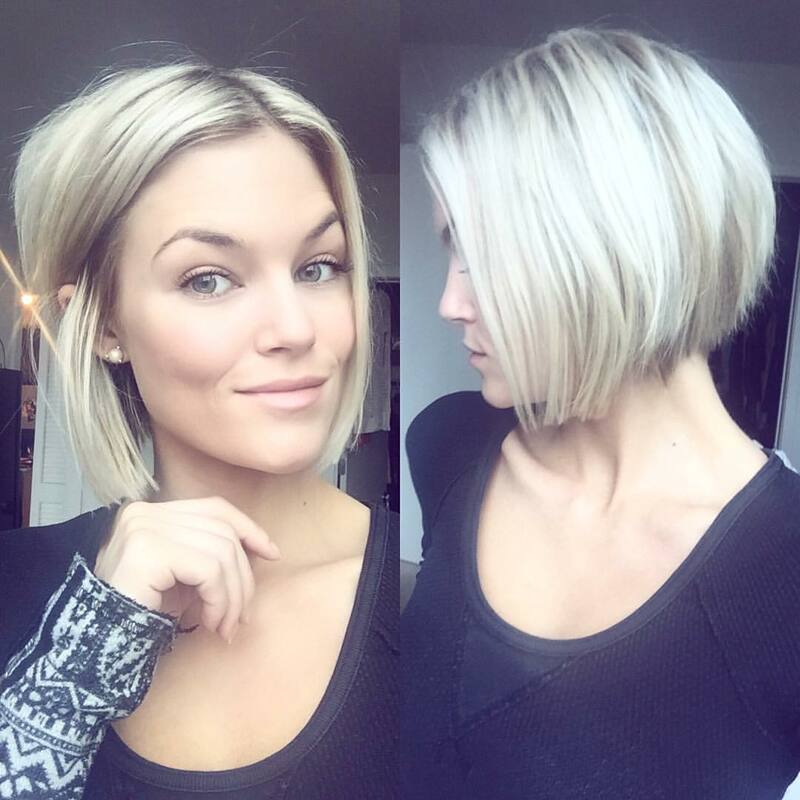 Thick straight hair is thinned and shaped into forward moving curves highlighted in platinum-blonde and increasing in density until the side-swept extra-long fringe is totally white.? 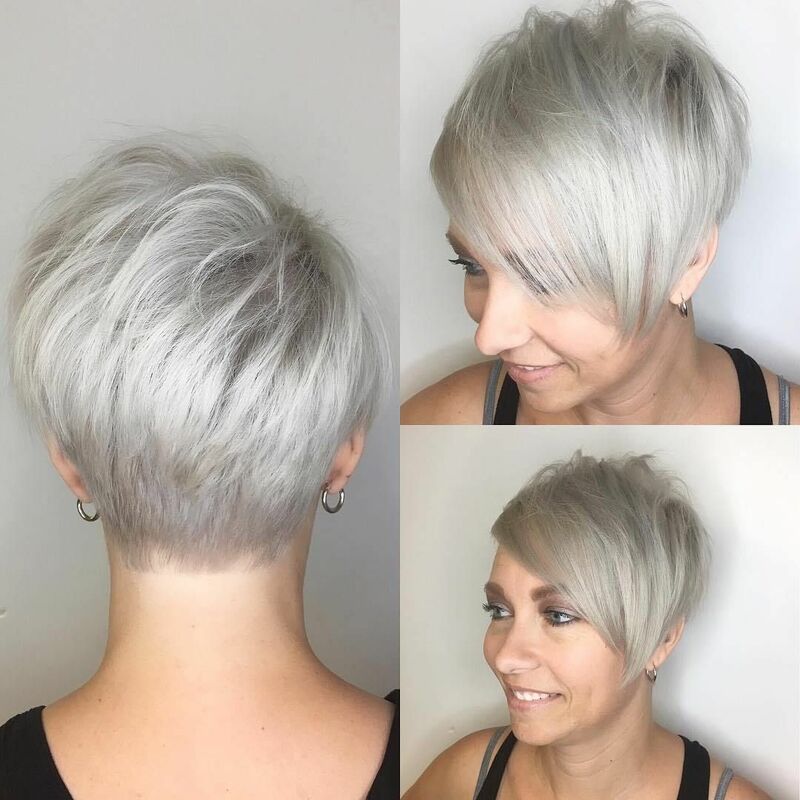 Colour contrasts accentuate the lovely texture and shape of this stylish precision-cut pixie hairstyle, with a 3-point finish at the nape. 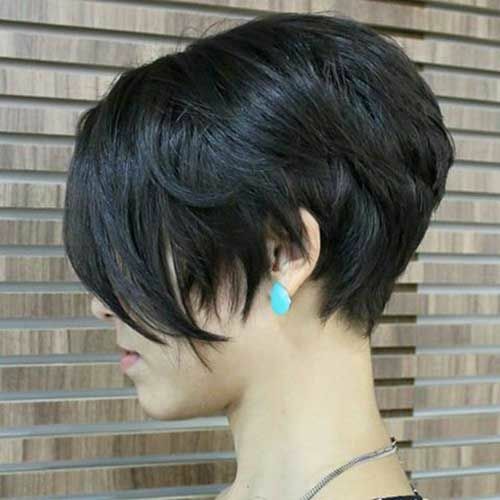 A trendy short dark longer pixie cut for women. 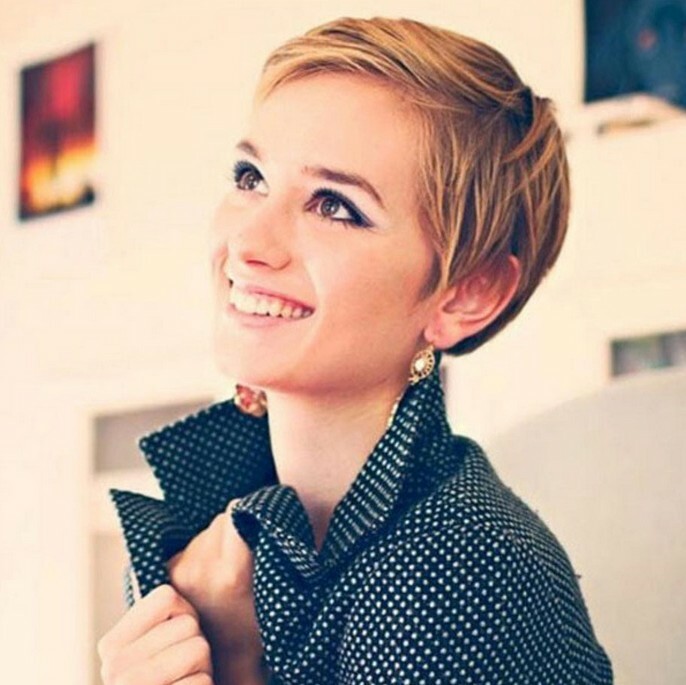 There are lots of new ideas in stylish pixie cut ideas right now, reflecting our love of diversity and experimentation.? 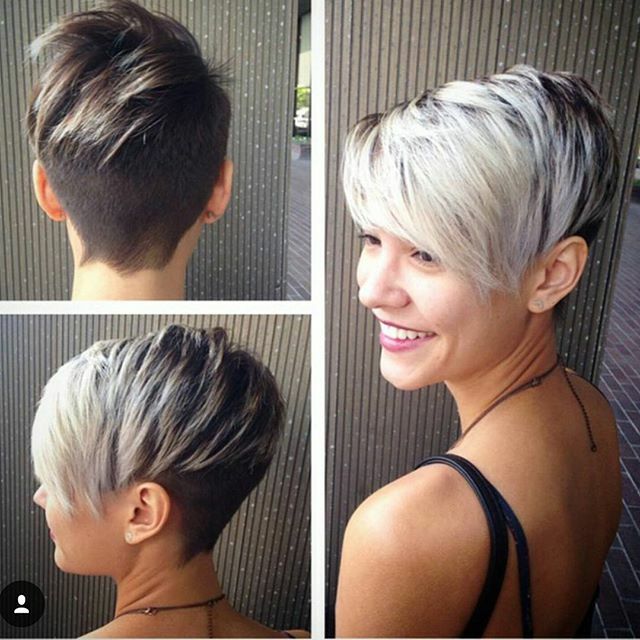 This easy-style asymmetrical pixie has 4 separate and attractive viewpoints to admire.? 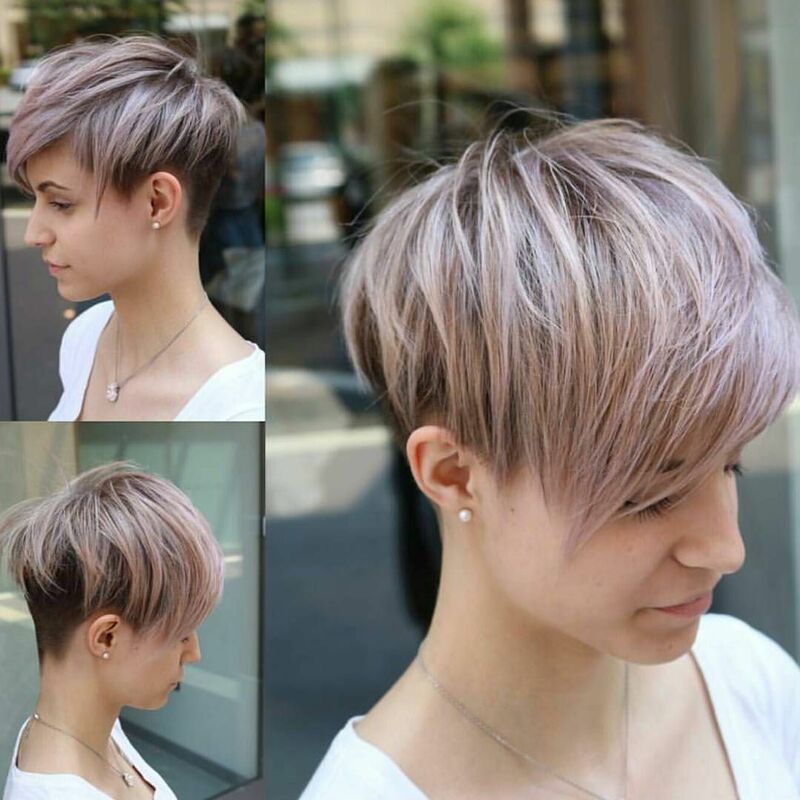 However, it’s also been bleached and tinted a medium-grey shade with rich pinky-lavender highlights.? 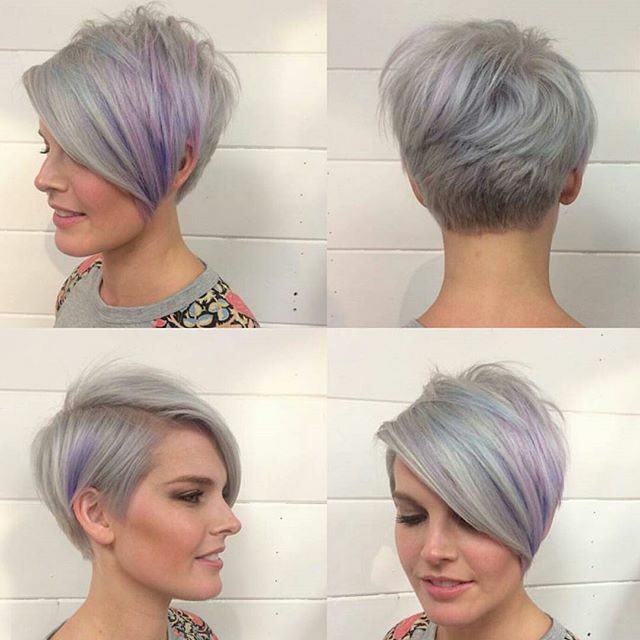 On the longer side the colours divide the long fringe from the short back and there are a few light touches of lavender accentuating the curve and volume at the back. Daily hairstyles are almost more important than evening hairstyles, because they create an image that everyone in your life sees! They should complement your skin tone and be easy hairstyles to do every morning, too!? 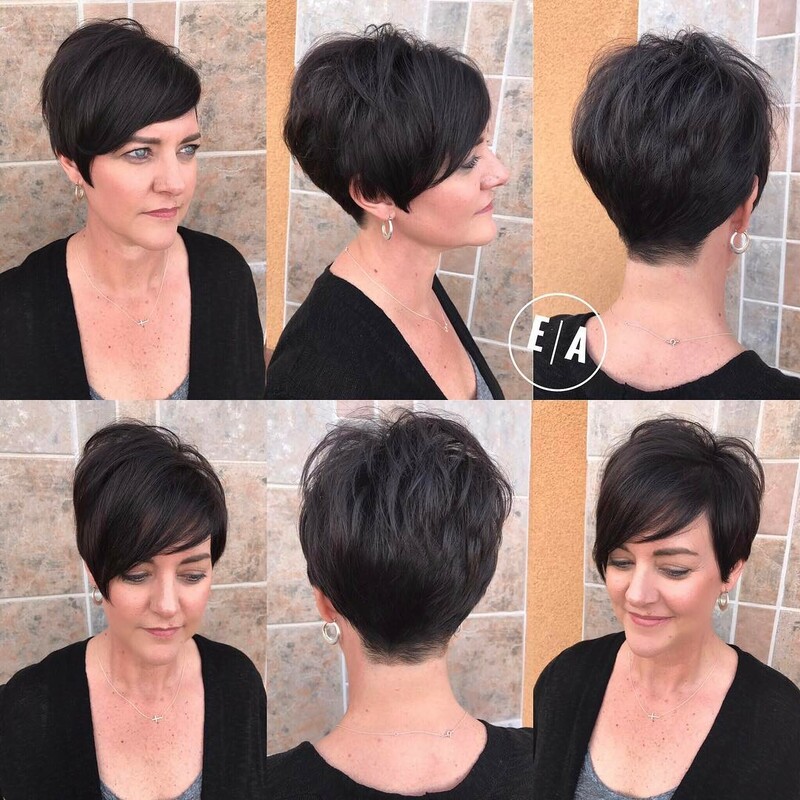 Here’s a confident pixie cut and colour with short, feathered bangs and plenty of texture and 3-D reflections across the top. It’s more suitable for an oval face, than a long face (as shown here).? 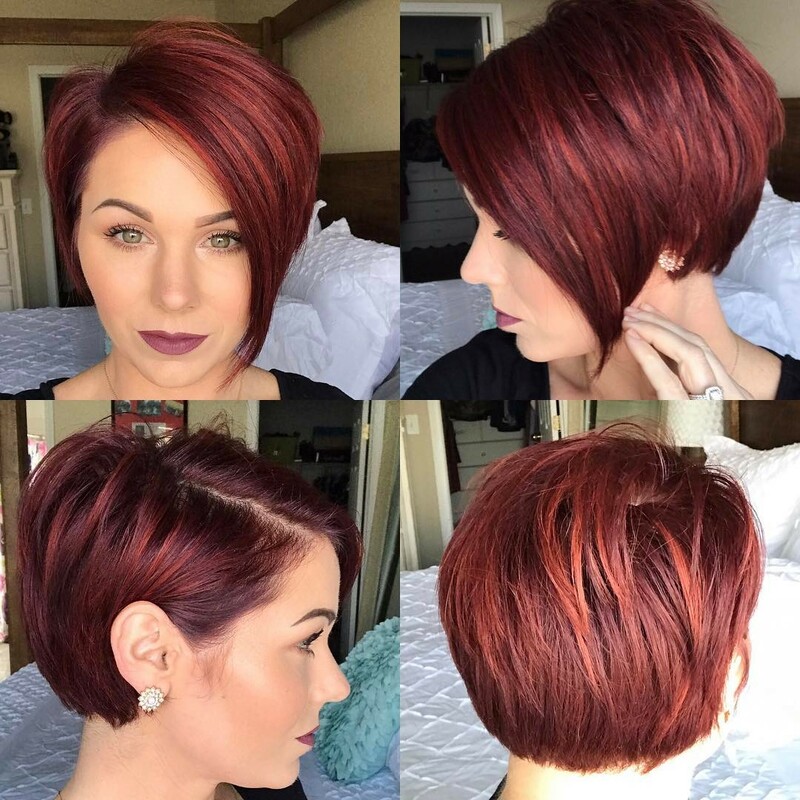 But the glory of this cute pixie cut is the rich, red colour that’s a great way to warm-up pale skin-tones, which the model definitely does demonstrate! 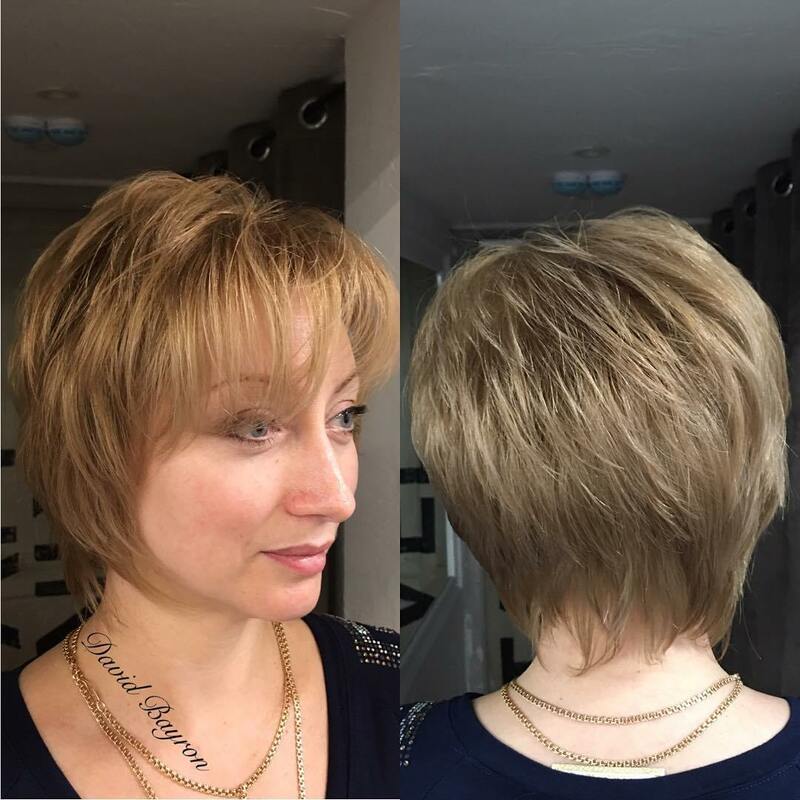 Pixie haircuts with short bangs are flattering for all age groups and most faces, except thin, long or square faces. 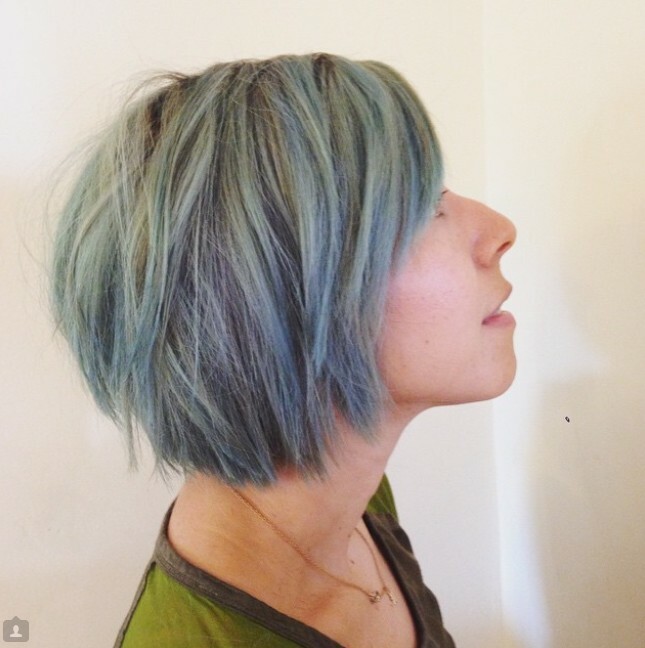 Definitely one of the best hair color jobs on the planet! And it’s pretty rare that we ever say that. The way the lavender and light blue blends in so well with the brown is mesmerizing in every way. 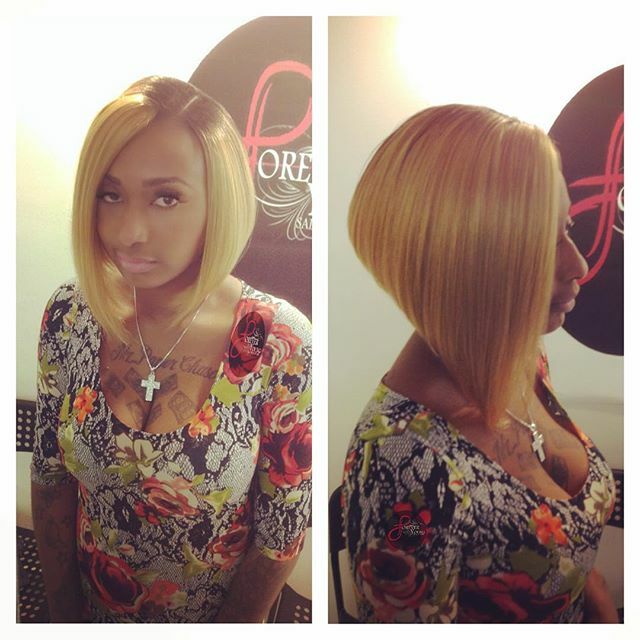 And with a short blunt bob like this one? It’s perfection. Truly perfection! 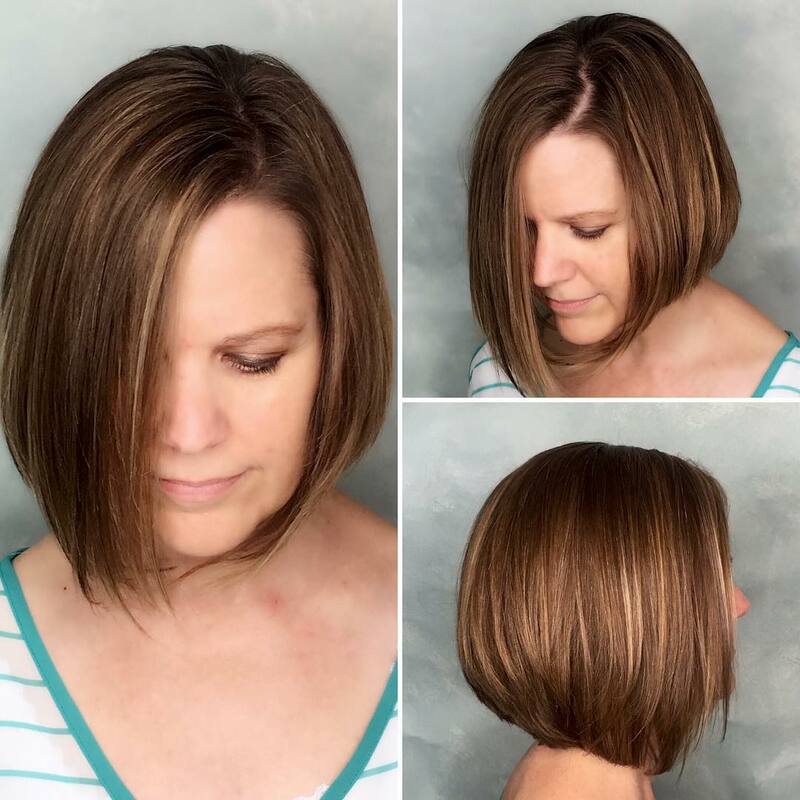 This bob haircut has an A-line back and choppy layers all throughout. And although her hair is already pretty thick, what makes it appear to have even more volume is the fact that it’s darker with blonde highlights on top. 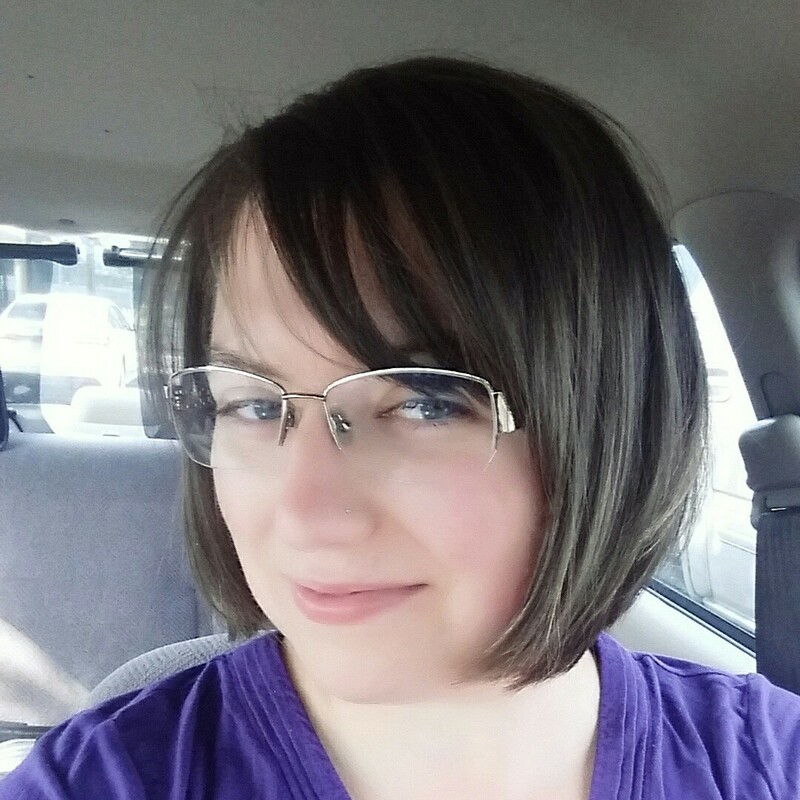 If your hair is naturally wavy, you might be hesitant about adding some bangs. 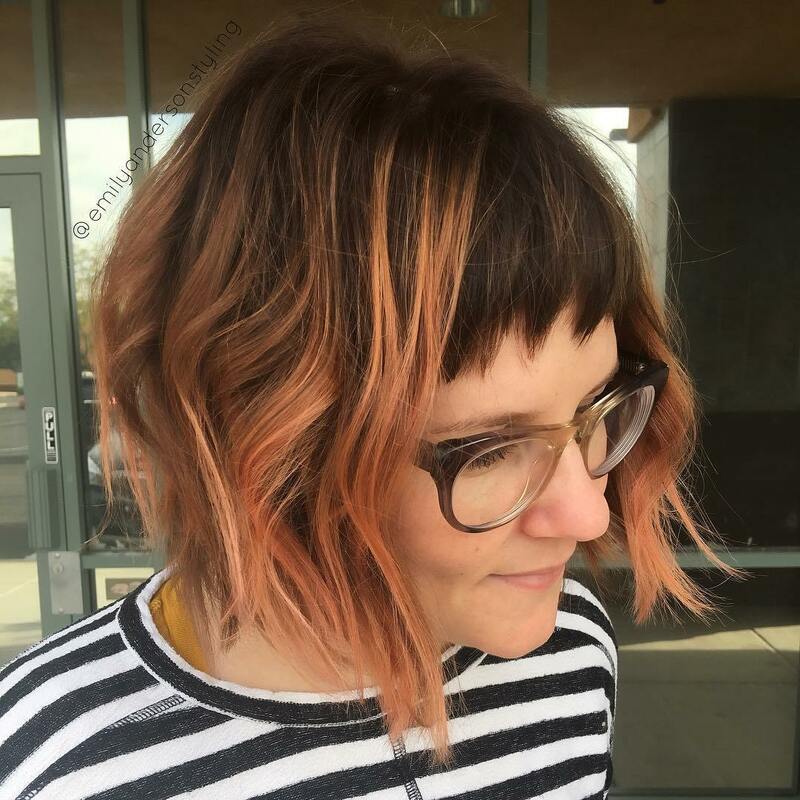 But with a bit of product and a big barrel curling iron, you can make your bangs super straight—a nice contrast to your otherwise curly bob. 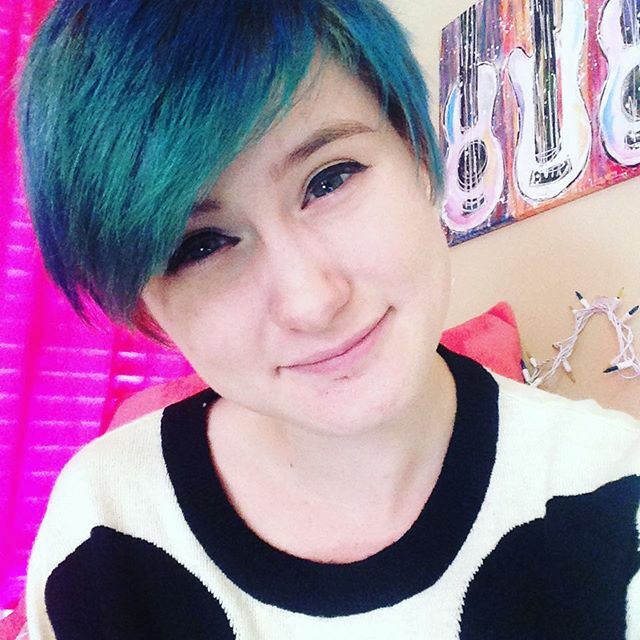 At first glance, you might think that her hair is naturally this color. That’s the sign of someone who has a great stylist! Actually, this is color-treated with about three different shades. A good idea if you’re someone who wants your thin hair to seem a bit thicker than it actually is. You simply can’t go wrong with waves like these! They’re messy, youthful, and perfect for casual days when you’re out spending hours in the shops downtown. And we’re absolutely adoring her bright blonde locks- not too light so they’re overbearing, but just light enough to glisten against the sunlight. 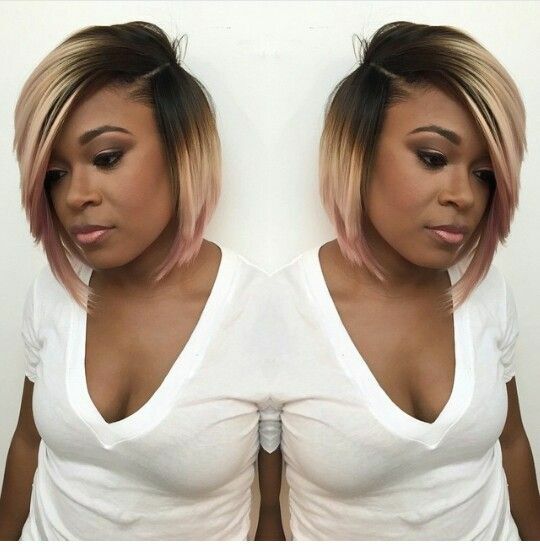 A great hairstyle choice to consider for summer 2016! 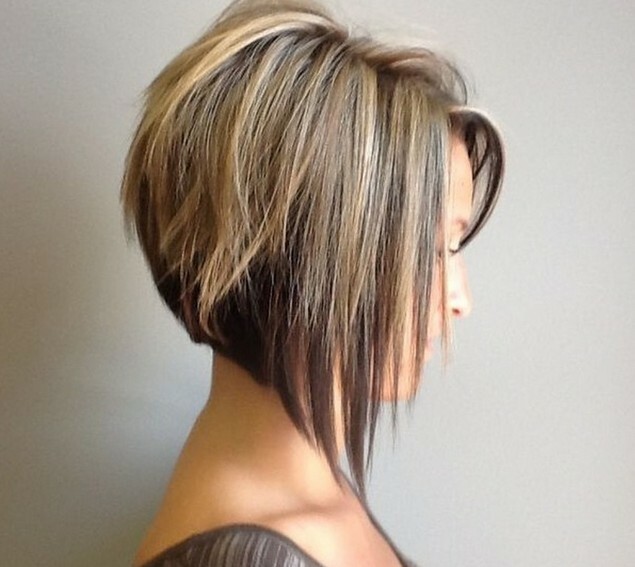 What we like about hairstyles like this one is that the coloring is what helps to bring out the cut. 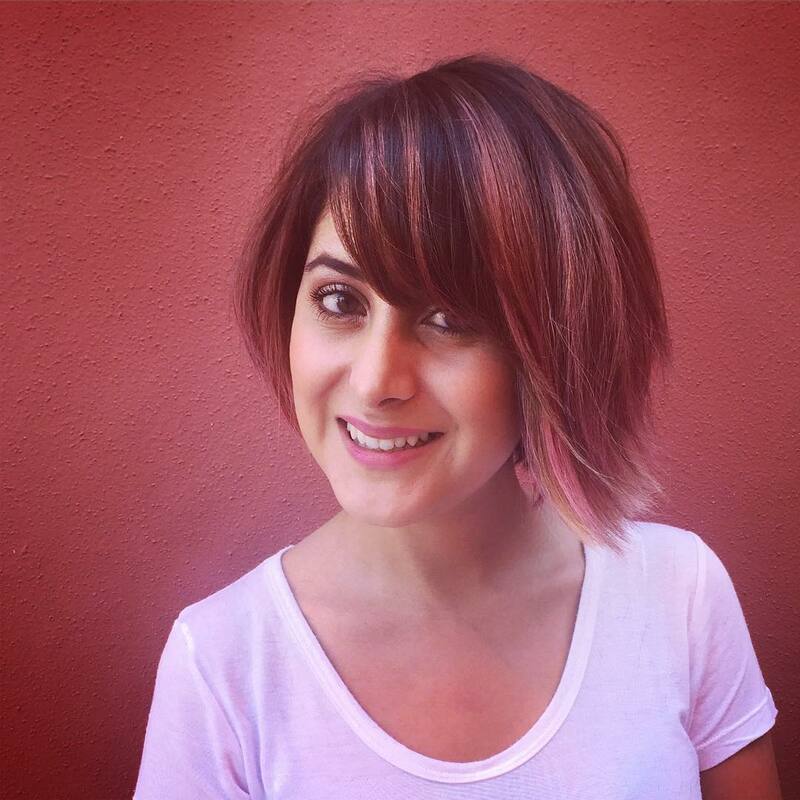 That’s why we highly-recommend that you get a top-rated stylist to pull off this look. 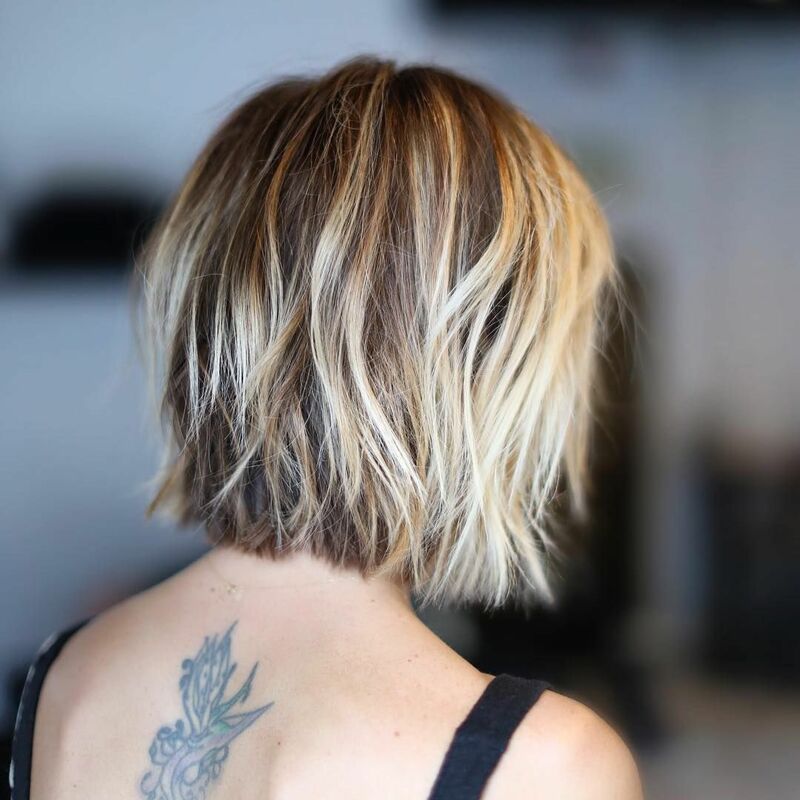 From the tapering of the neckline to the bold chunks of blonde coloring on the first couple of layers, it’s a professional look that needs a professional’s touch. African American hairstyles: This is a gorgeous, new look I haven’t seen before!? The 3-band colour design is like a lovely Neapolitan ice-cream of coffee, cream and strawberry pink, for a very cute African American hairstyles’ option!? 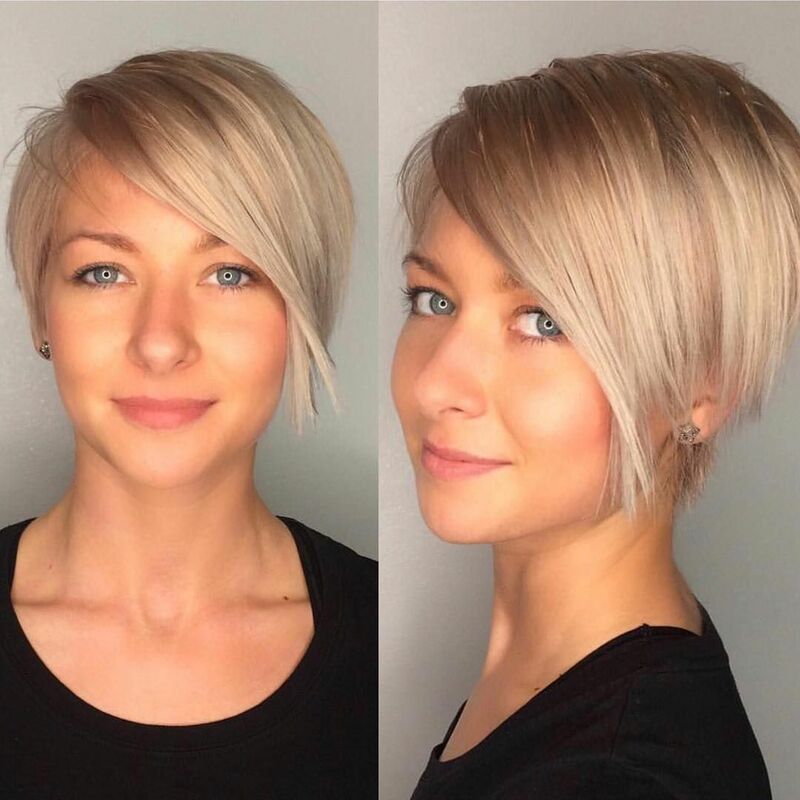 Short, choppy styles flatter round, oval, heart and long faces making it easily one of the most popular hairstyles for spring/summer 2016!? Keep the height on top if you have a round face, but comb it flat if you have a long face. Pink curves either side of the chin add width on a heart face.? This original twist will freshen up any? 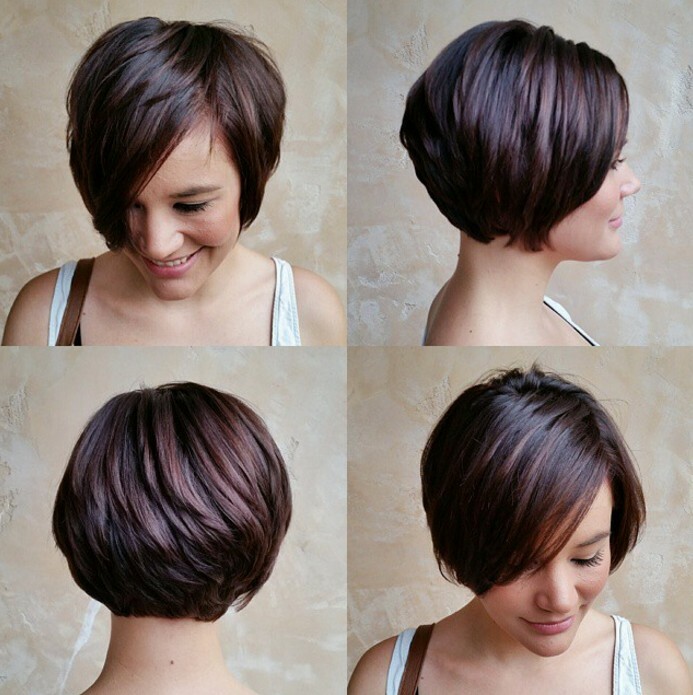 choppy bob and be one of SS2016’s most popular hairstyles for black women who love being first with a new look! 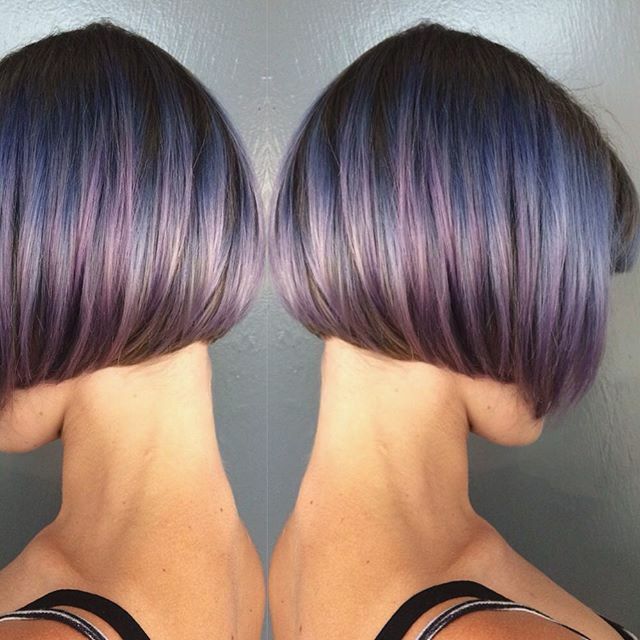 If there’s one thing that’s on the top of the charts for 2016, it’s this: wild colors! 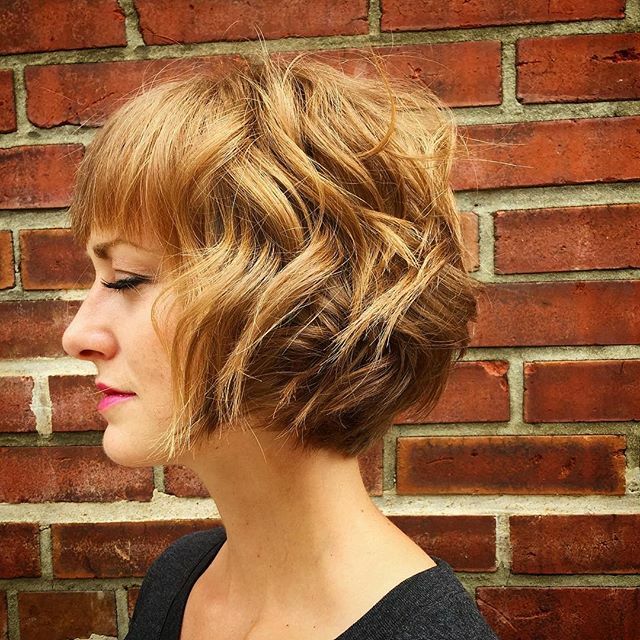 And this particular choppy bob hairstyle showcases the art of wild style perfectly. 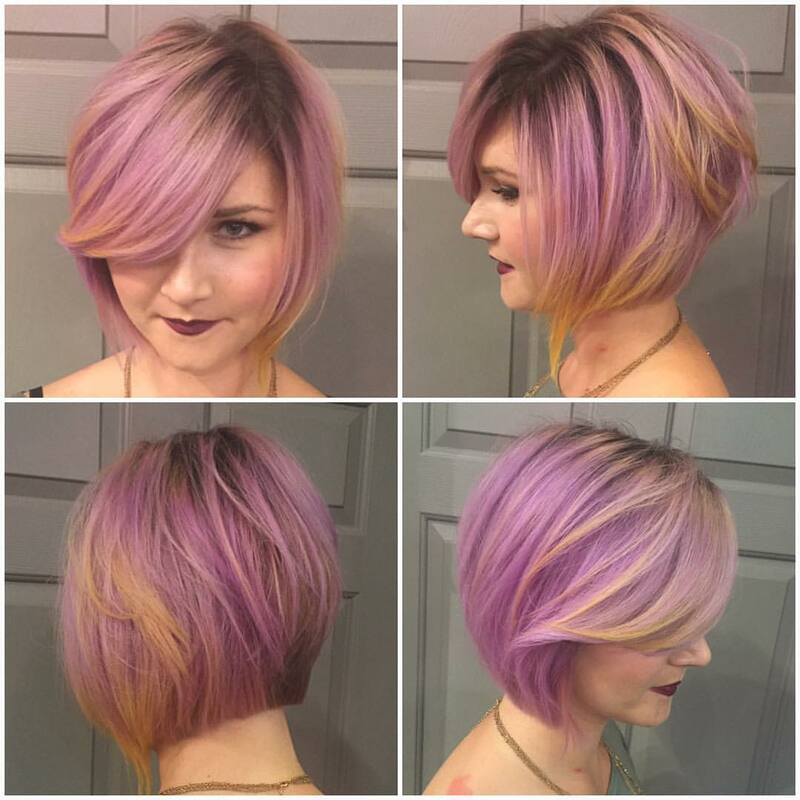 If you’re in the mood to step out of the box and try on a crazy, look-at-me style, consider adding splashes of blue, purple, and blonde to your mane, and finish with a trendy side part. 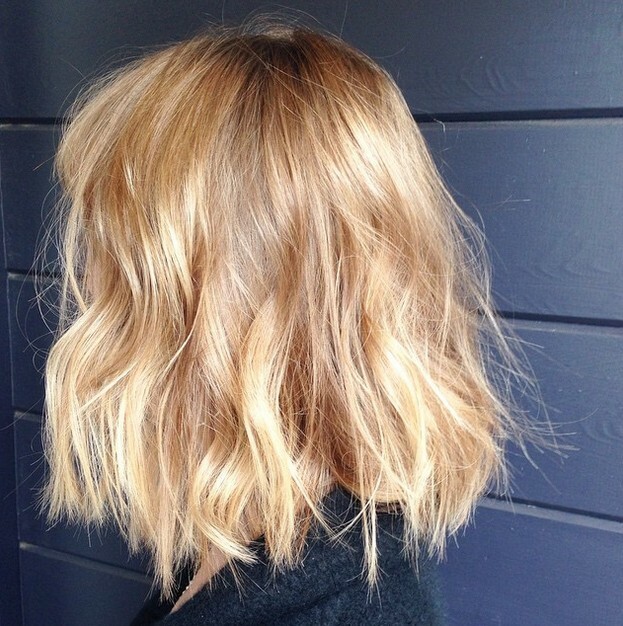 If your skin-tone is warm you’ll look better with a medium-blonde colour design.? 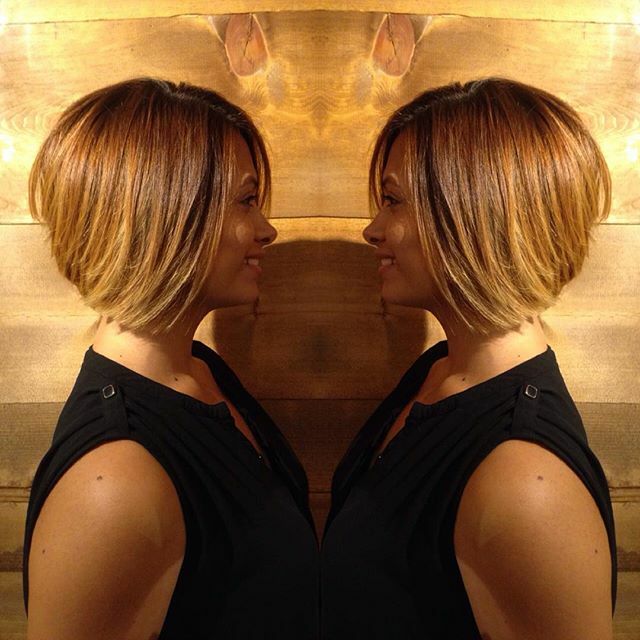 This A-line bob is shown in profile to capture the beautiful asymmetry and cute caramel, gold and honey blonde tones.? 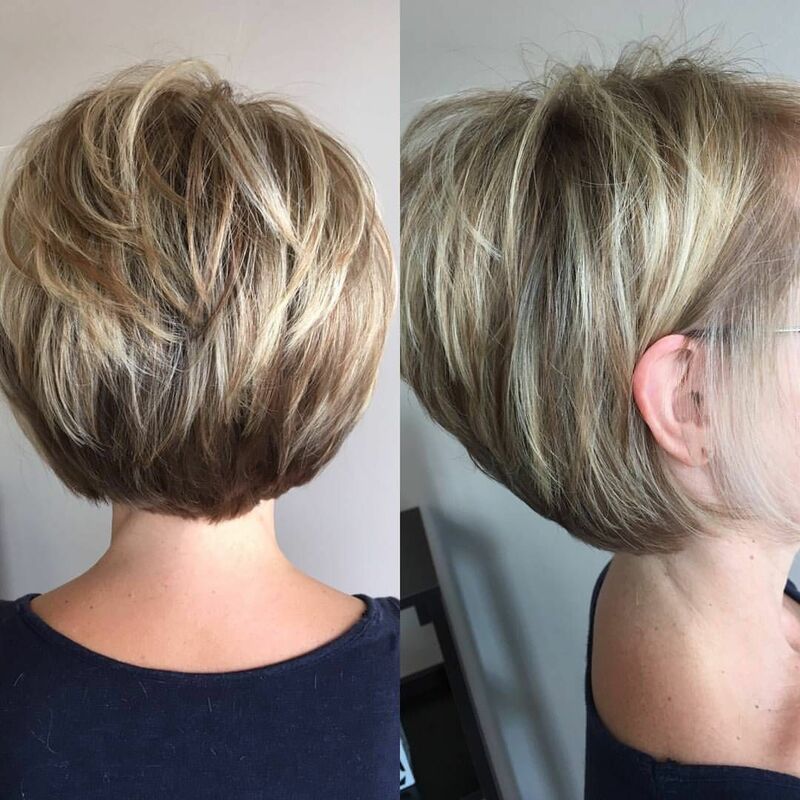 This is one of the most popular hairstyles for thick hair types, as the stacked back is all that’s needed to create a fashionable curved shape at the back.? 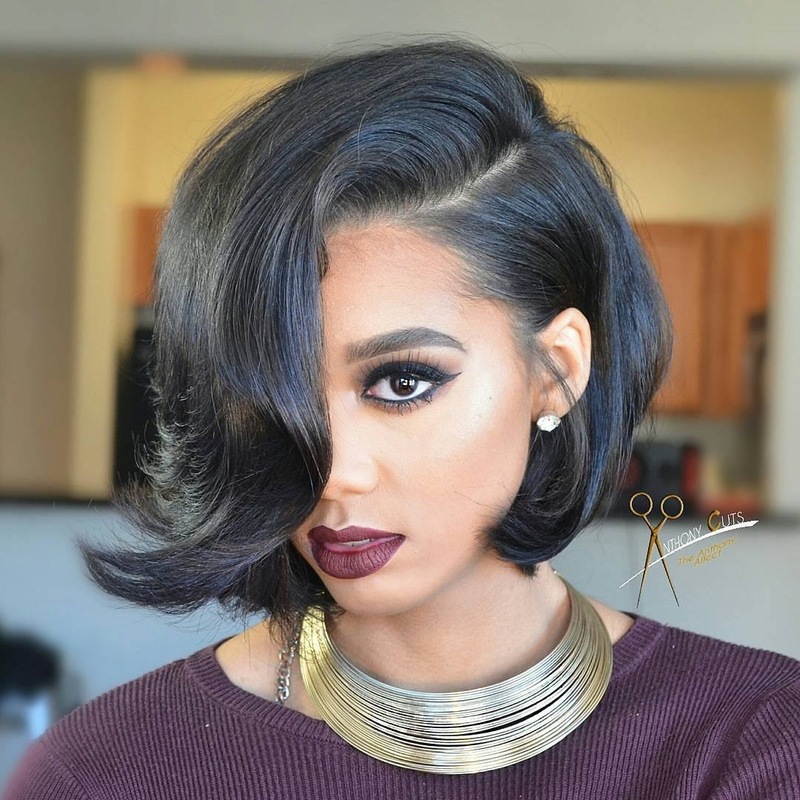 And if you prefer not to waste time fiddling with your hair to make it look good, this bob is an easy hairstyles choice .? 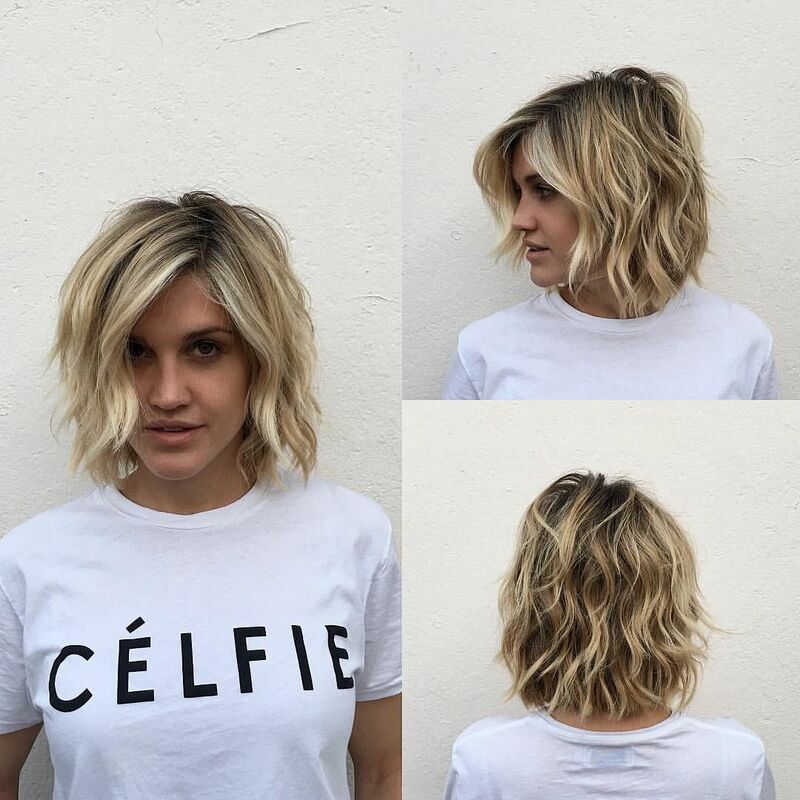 It’s a trendy bob hairstyles option, which suits a wide range of face shapes including oval, round and long.? The side-parting and diagonal section across the face breaks-up a circular face and ‘shortens’ a long face.? 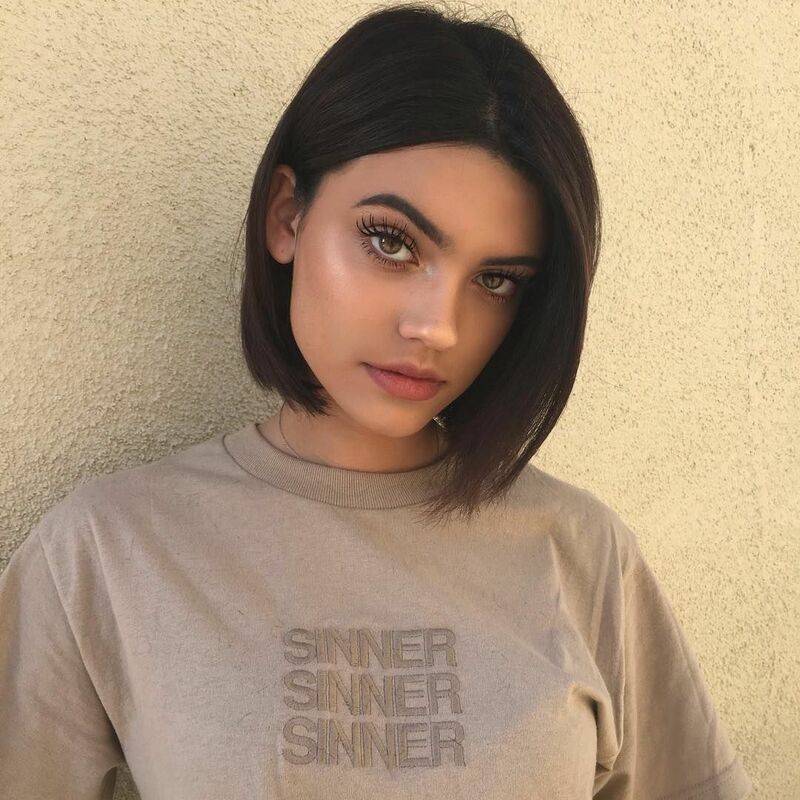 This gorgeous colour actually has three different shades blended together and will accentuate gold or olive undertones in your skin-tone and in a very flattering way! 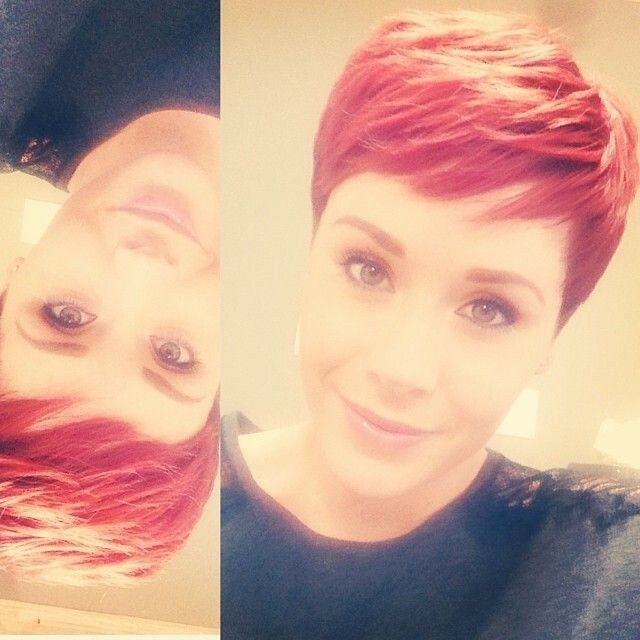 If you’re one of the ‘young and restless’, this fab long pixie cut is stylish and unmissable!? You’ll certainly get yourself noticed in this bobby-dazzler pixie hairstyle, in vivid sea-green plus royal-blue highlights around the crown.? Maybe not one of the recommended daily hairstyles for school, but you can express your individuality in the holidays for winter, spring and summer 2016! 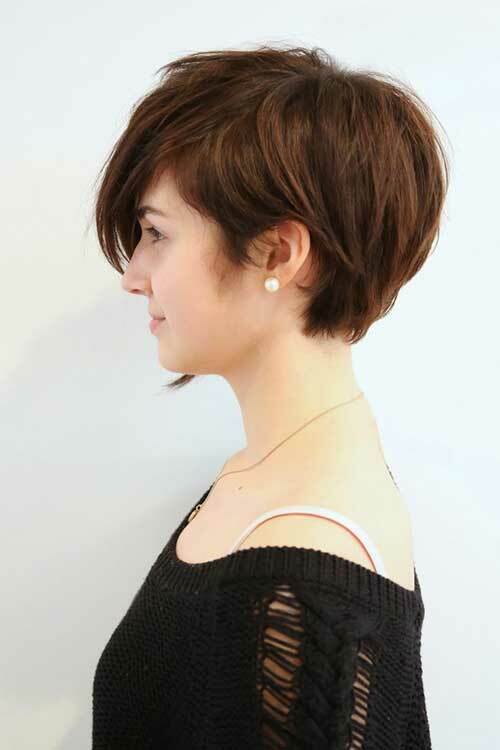 This example of teen short hairstyles with bangs, is fashionably based on a long pixie cut for medium or thick hair. 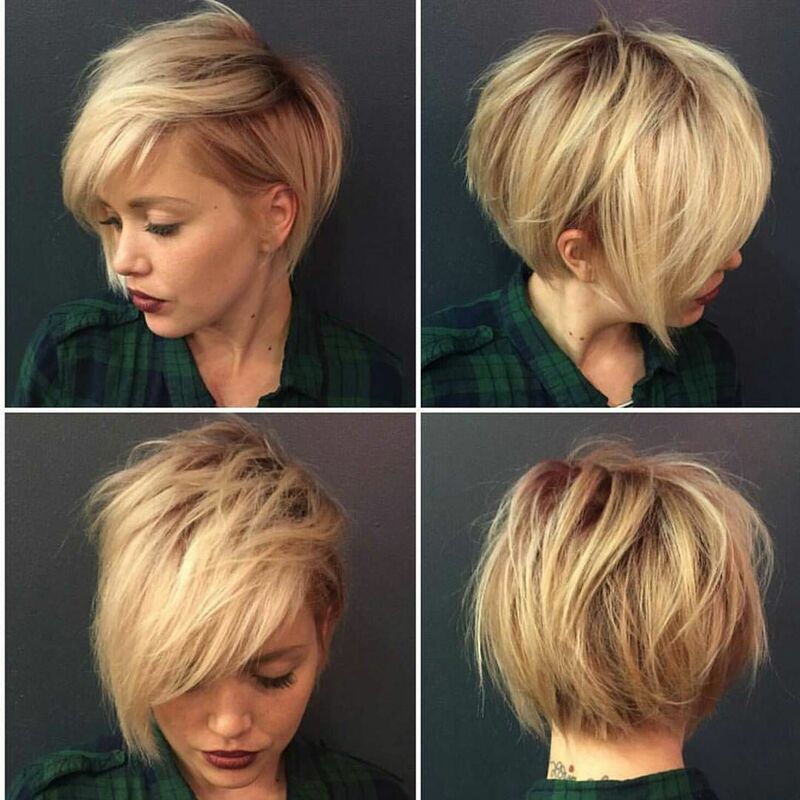 It has lots of layers to create an easy hairstyle with an attractive curved shape and diagonal thick bangs.? Notice how the model has matched the hair colour to her gorgeous blue eyes and cool skin-tone. Suitable for a long, round, oval or heart-shaped faces. 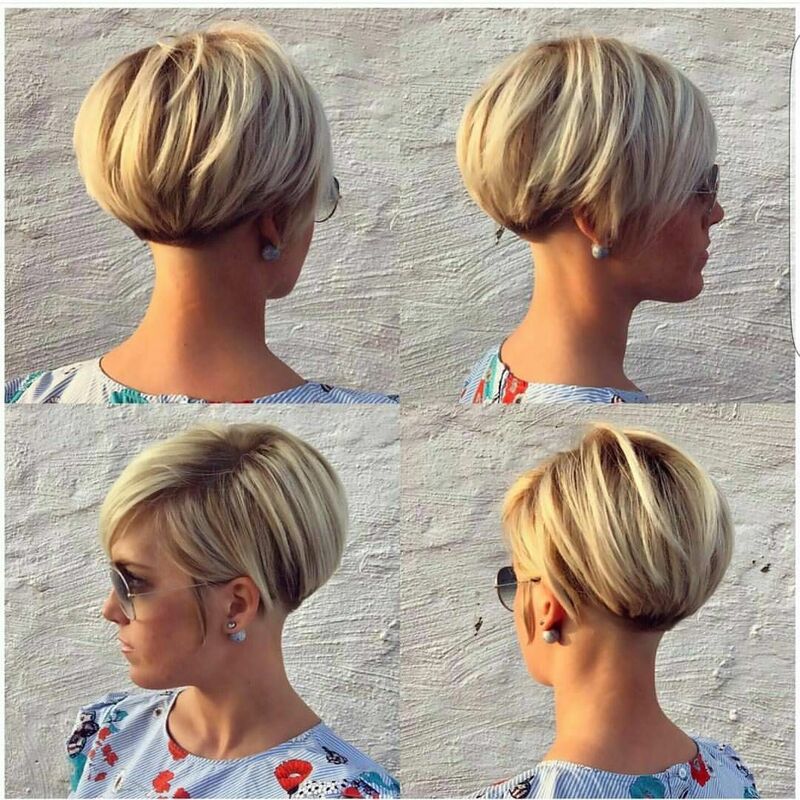 Here’s a very easy pixie haircut to style, making it high up on the list of popular daily hairstyles that fall into place with no fuss.? 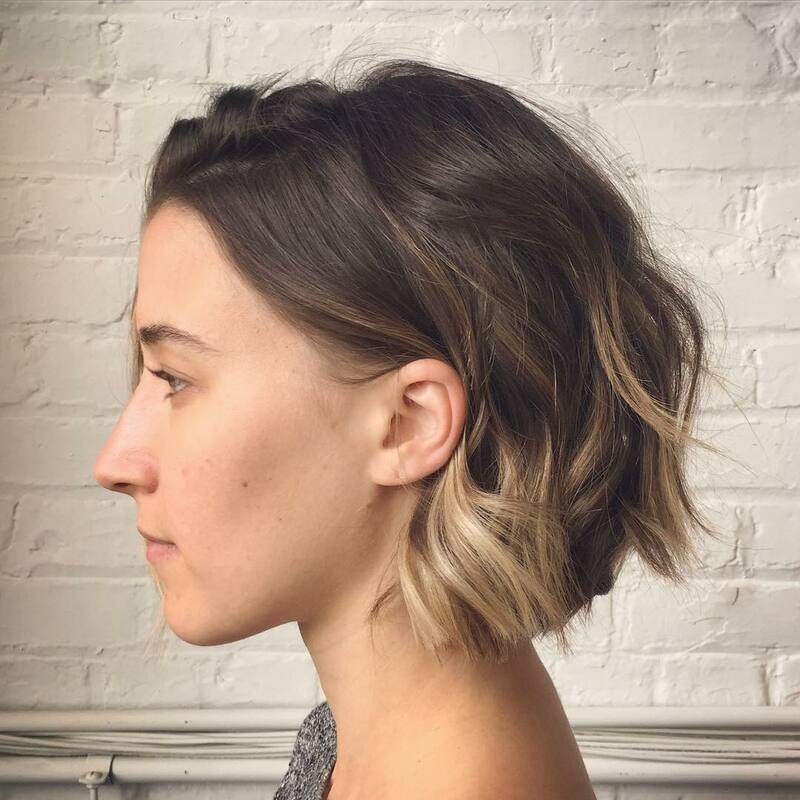 Long pixie haircuts can also be a short bob and this one has beautifully cut, vertical, sliced layering for thick or coarse hair.? This removes any bulk and shapes a lovely curve from crown to nape.? Extra volume around the crown comes from combing the long layers forwards.? 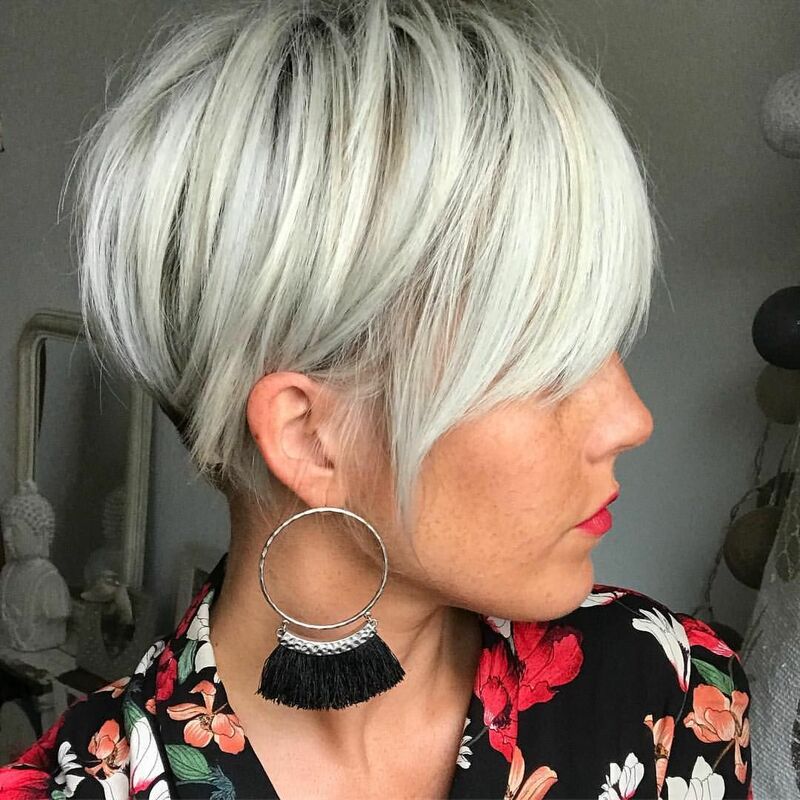 Daily hairstyles with a blurred side-parting, showing a bit of forehead and with a long, draped fringe are great for oval, round, long and heart-shape faces.? 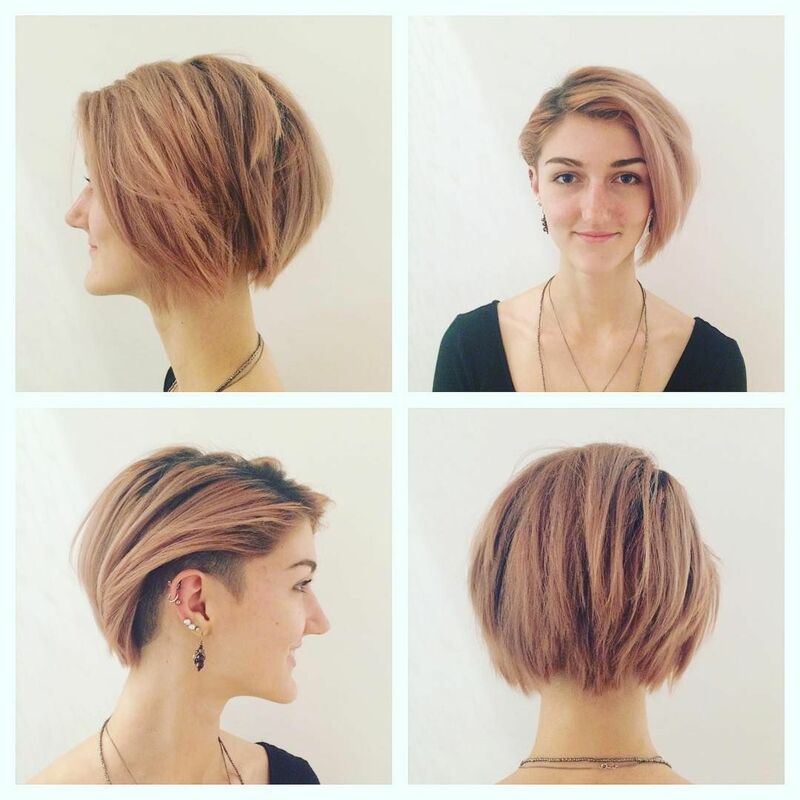 The back is brushed to one side, showing amazing texture and making this an outstanding short hairstyle.? 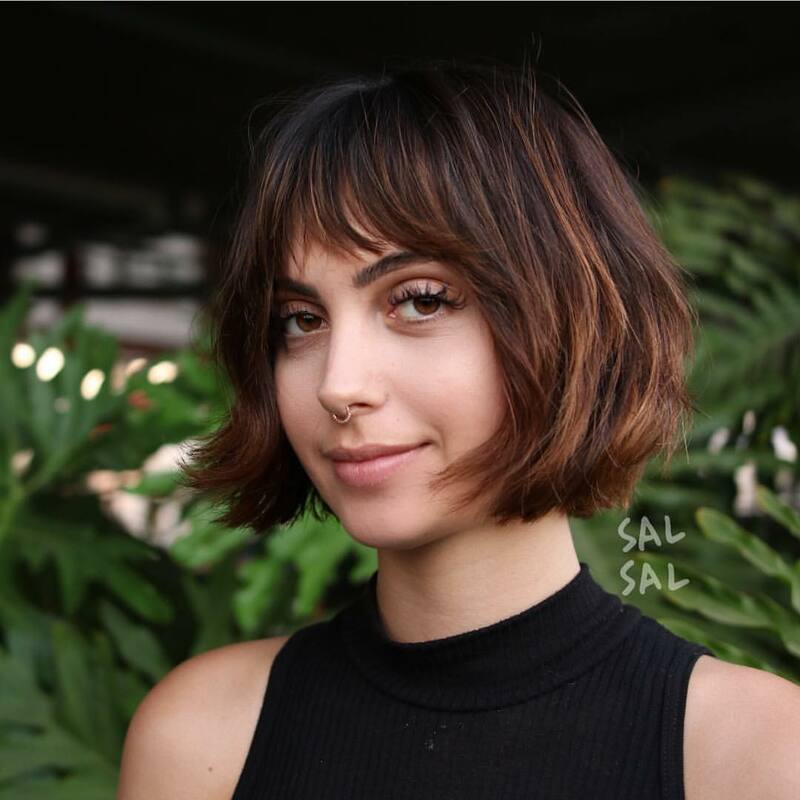 This smooth, short haircut suits most face shapes and? a sophisticated image! 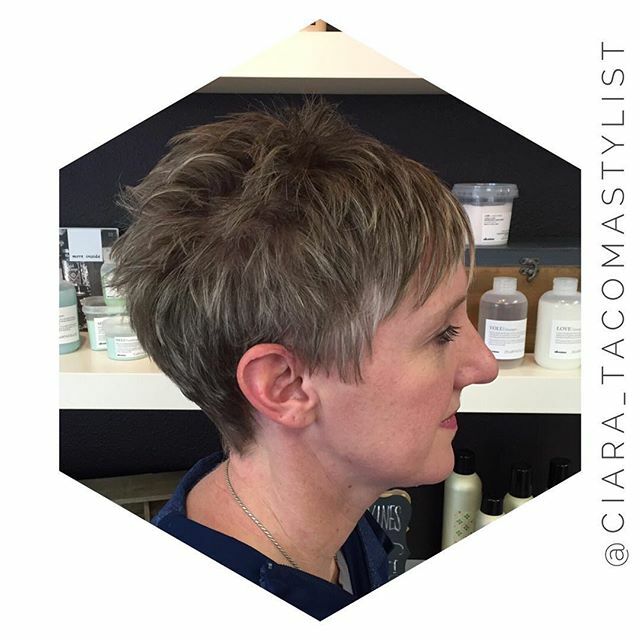 Extreme asymmetry remains a feature of the edgiest popular hairstyles for spring/summer 2016.? 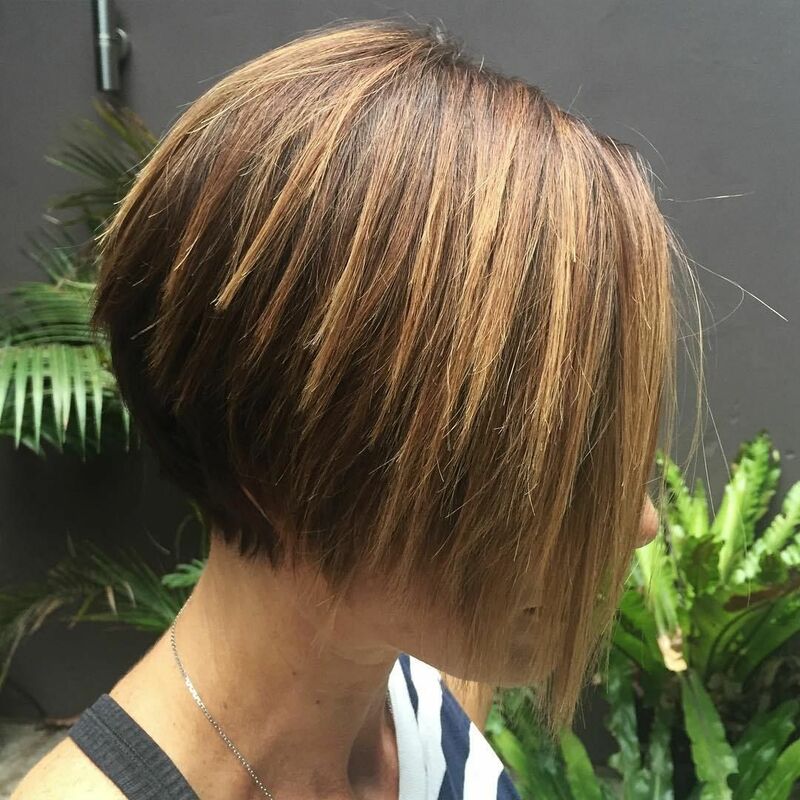 This bob has double asymmetry with a lovely long sweep from stack-cut layers beginning half-way down the back.? And the front reveals unexpected, uneven sides with the right reaching just below the collar-bone and the left brushing the collar-bone!? 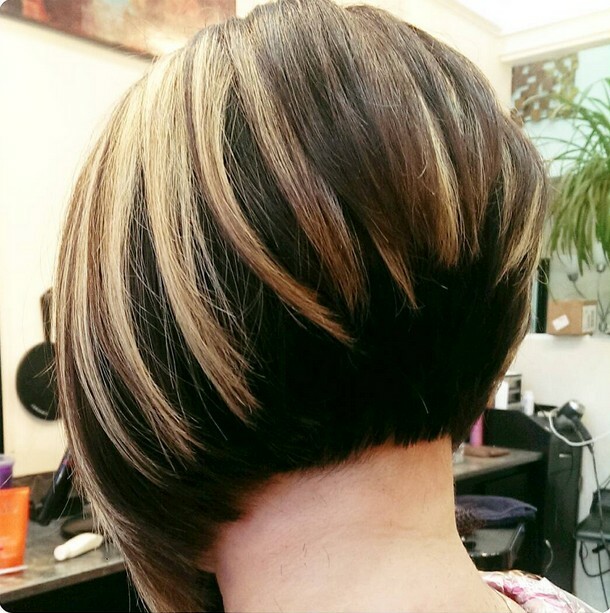 And complementing this original, smooth bob hairstyle, is the fab shade of yellow-blonde.? 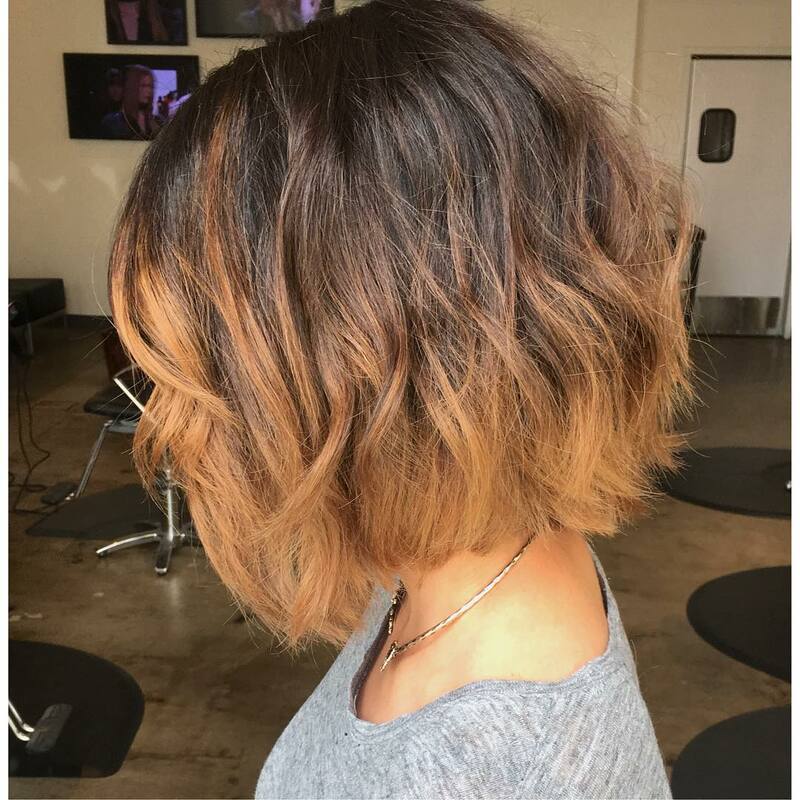 With a little back-combing (teasing) on top to add height, this original example of Spring/Summer 2016 bob hairstyles for black women flatters oval, round or heart-faces. 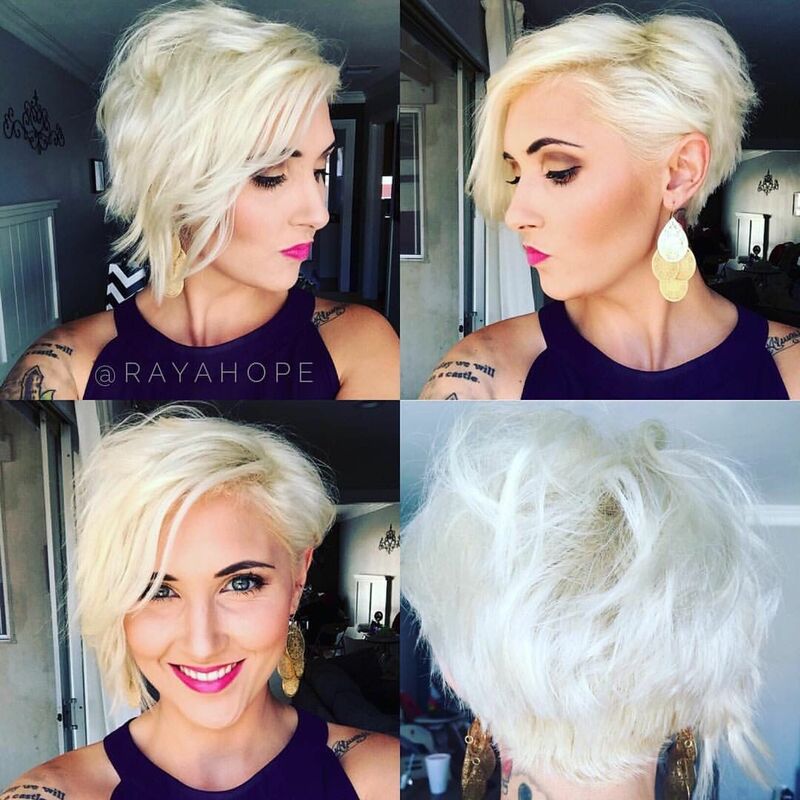 Under: Pixie Short Hairstyles Do You Love the Pixie Cut?